Singapore men and women national 7s team will have something in common with the defending HSBC Singapore Rugby 7s champion Kenya come this April. The Singapore teams will march onto the field on 14 April at the Yio Chu Kang Stadium for the 2017 South East Asian 7s (SEA 7s) in national jerseys by Samurai Sportswear. Kenya, who will defend its HSBC Singapore Rugby 7s title on 15 and 16 April at the Singapore National Stadium is also sponsored by Samurai. Last April, Singapore lost both men and women finals to Thailand in the SEA 7s on home soil, while Kenya beat mighty Fiji to win the HSBC Singapore Rugby 7s for their first ever World Sevens Series title. 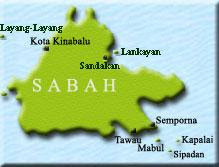 The SEA 7s is an important ancillary tournament of the 2017 HSBC Singapore Rugby 7s and a key warm-up tournament for nations competing in this year’s Southeast Asian Games (SEA Games) in Kuala Lumpur. Additional firepower and inspiration has arrived in the form of a new national team apparel sponsor, Samurai Sportswear. Samurai is a popular UK sportswear brand and its name is derived from the Samurai 7's team, regarded by many as the world's most successful invitational Rugby Sevens team. The team name was inspired by 'Samurai spirit' and the free-flowing rugby and immense belief shown by the Japanese team at the 1995 Rugby World Cup in South Africa. Following last year’s Asia 7s series, SRU commenced selection trials to pick this year’s SEA 7s and SEA Games squad. Intensive training for the SEA 7s commenced last month and SRU is hoping for both teams to reach the finals in this important build-up tournament to August’s SEA Games. Southeast Asia’s rivals set to tackle SEA Games warm-up event. Held at the Yio Chu Kang Stadium on 14 April from 9am to 730pm, the SEA 7s will feature eight men teams and 6 women teams playing in a group league followed by a knockout format. The SEA 7s men and women’s finals will be played at the Singapore National Stadium on 15 April during day one of the HSBC Singapore rugby 7s. Already confirmed for the men’s SEA 7s competition is Singapore (2 teams), Malaysia, Phillipines, Thailand, Laos, Indonesia, Brunei, while the women’s event will feature Singapore, Malaysia, Philippines, Laos, Indonesia and 2015 SEA Games champion Thailand. 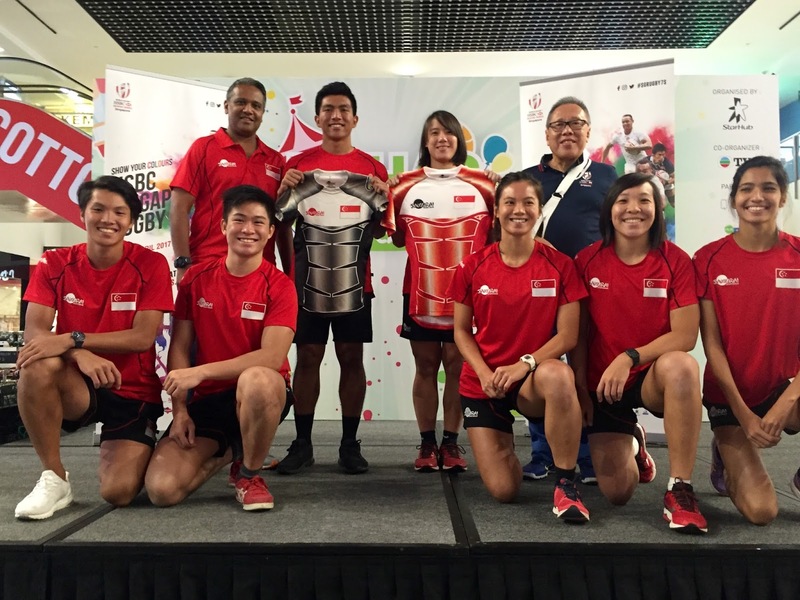 National players in the heartlands to drum up support for HSBC Singapore Rugby 7s. 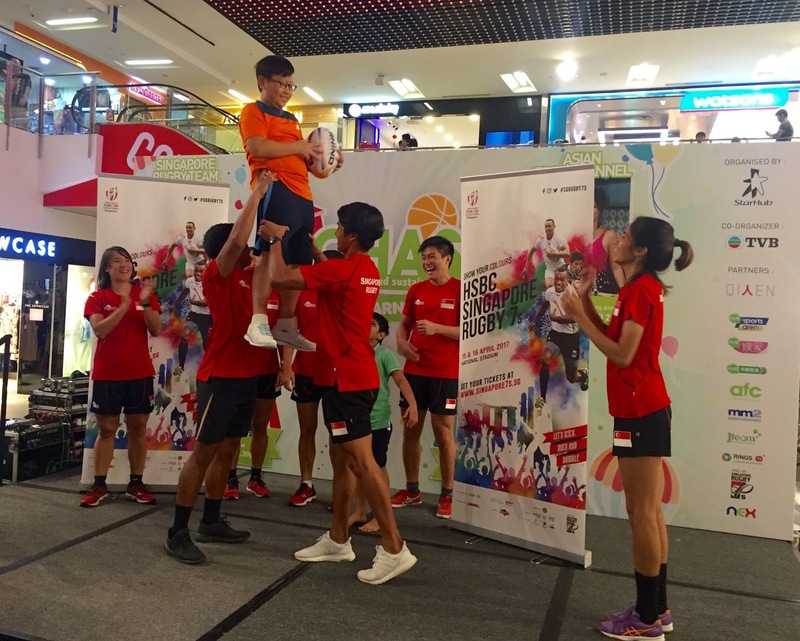 Members of the national 7s teams, incluing Owyong and Isharf, were at NEX shopping mall in Serangoon Central this afternoon to unveil the Samurai-sponsored national jerseys. Besides sharing their thoughts on the upcoming SEA 7s, the players also demonstrated rugby moves like a scrum and a line-out to an appreciate audience in the heartlands of Singapore. Rugby fans keen to support Singapore and the Southeast Asian teams in the SEA 7s can head to Yio Chu Kang Stadium on 14 April as admission is free. For the final of the SEA 7s to be played at the HSBC Singapore Rugby 7s. Prices for children and adults start from as low as S$2 and S$50 respectively. 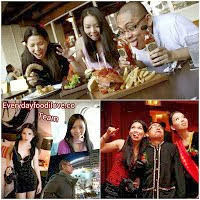 Due to popular demand, organisers have released an additional 300 new Platinum tickets priced at S$300 per person. The Platinium two-day passes come with special accreditation, a free 70-page tournament booklet, plus limited alcoholic drinks, two buffet meals and snacks from the dedicated Platinum Bar. Ticket holders also have access to the After Party at Clarke Quay on both nights. The new tickets go on sale immediately and are strictly limited till stocks last. Expect to ROCK, RUCK and RUMBLE at the 2017 HSBC Singapore Rugby 7s this Easter, with sixteen of the world’s best rugby sevens teams, always-on live entertainment, top-notch cuisine, interactive games for the whole family and tantalising prizes on the menu. Fans are encouraged to arrive in home-made costumes and fancy dress to “show your colours” in support of their favourite teams.